How delightful it is to slow down but how strange it is also! I have had to give myself a good talking-to – it is OK to spend hours lying on the couch reading an absorbing book. It is also OK to drift off to sleep in the middle of the day for an hour. And how pleasing it is to drive anywhere with no parking hassles at markets or strip shopping centres. Amongst the indolence have been some lovely social moments. New Year’s Eve. With best friends. On a balcony. Perfect evening. Everyone asked to bring a plate. I brought a trolley loaded with some of my ham and turkey mini-pasties mixed with eggplant chutney, and a major dish of John Dory fillets settled on a bed of gently-cooked tomato, scattered with amaretti crumbs and baked for 20 minutes. 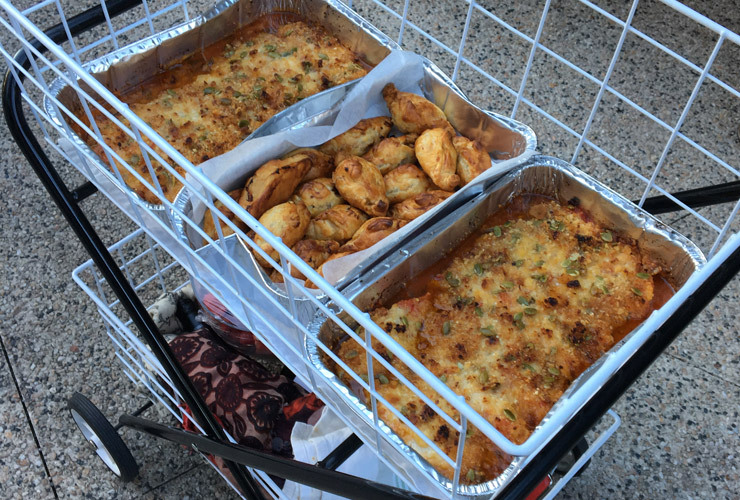 ‘Me and my trolley strolled down Victoria Street’ and delivered the still-warm treats.